Parking is very much the talk of the town right now. 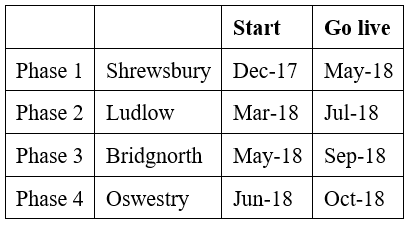 Shropshire Council is consulting on major changes to parking charges and arrangements across the county including in Ludlow. In the last few days, our parking meters have been upgraded to accept the new pound coin. That’s good news as we haven’t seen the old coins in town for some while. One of the next steps will be to replace the existing pay and display parking machines with flexible, eco-friendly models. We don’t know yet the full capabilities of the machines that will be installed in Ludlow but I think they could benefit our town. The pay and display machines currently used in Ludlow’s car parks and streets are somewhat primitive. Most of them rely on mains power and that means digging up streets and tarmac to lay power cables. The new machines will be solar powered. The existing machines do not take cash or credit cards. The replacements will allow you to insert or tap a card to pay – as well as paying by coin. That is essential as we progress towards a cashless society. It will bring an end to the annoying hunt for small change when arriving to park in Ludlow. Most of us have experienced the stress of rushing back to the car having spent rather too long on a last coffee, every moment worried that an eagle-eyed warden will have slapped a yellow ticket on the windscreen. At the moment, drivers must pay to park in Ludlow when they arrive rather than when they leave. The new machines will have the potential to “check in, check out”. Drivers will enter their registration when on arrival but they will only need to pay on leaving. This scheme is already in place in many areas of the country, including Newcastle. There are other technical advantages that the new machines might bring. They could supply real time remote data to Shropshire Council (though I doubt the council would need or be able to use this information for Ludlow). There is also the potential of using the terminals for local promotions, retail vouchers and advertisements. That could help promote local businesses and festivals.